The Index has been updated! Please check your links and win-loss/% record to see that everything is hunky-dory. If I missed you or messed up you entry, just PM me and I will be happy to fix it. How do I update my original post? Press the little EDIT button on the bottom of the original post. This will allow you to add new tournament armies to your original post as well as update your record and winning percentage. Remember your entry in the index links to your original post in this thread. How do I calculate my winning percentage? Take your total number of wins and divide it by the total number of tournament games you've played [wins / (wins + losses + draws)]. How should I format my entries? Many people keep a running total of their wins/losses and win% at the bottom of their original post. What's up with the smilies? I have participated in 50 tournaments dating back to my first one in February 2006. I have traveled to different cities and played a variety of different people. The following is a break down of my performance, armies, played, and opponents. Loss to Jonathan, win versus Finrod. I am 143-78 overall in tournament play for a 64.7% win rate. My nemesis is Dignan having faced him 5 times in 1v1 tournament play, losing all of them. I was sort of hoping others would post their tournament armies, records, and experiences in this thread. Doh! How could I have forgot? And shhh.....don't tell anyone about that game at the ram where you didn't lose a single figure and wiped the floor with me. What happens at the Ram, stays at the Ram. My total tournament record is now 89-37 for a 70.63% win rate. Last edited by killercactus; October 21st, 2012 at 08:33 AM. I haven't had the honor of playing ManTrain......yet. This army was kind of like playing checkers with 28 checkers. When it worked, it was unstoppable. When I started losing, I couldn't catch up. This army was fun for me, but really frustrating for my opponents. The game against SW8K was very intense in the middle, but then I clearly lost. I'm 2-0 now against Codeman, but only with a +165 PD. This army was very swingy. If I lost Nilfheim or too many Minions early, I had little offense left. The rats were almost unnecessary because my army was so tough, although they did a good job of holding the glyphs in all but one game. When I won, I won by a lot though. I actually liked the 6 swogs. I knew that I'd have trouble with Valiant 4th Mass, and I had to face it 3 times. It felt good to get a win prominently featuring my favorite figure. Note: My only two wins were against NESA guys. I was going to play the same army as Matthias Maccabeus. I dropped out so he could win it. Then I saw District 9 with three of my good friends. Battle Report Warning: contains Summoner Wars. Now I'm up to 110 people played (in heroscape in or out of tourneys), and 118 tournament games. Here's a link to my record playing different units, as well as against different units in tournaments. You can see that pretty much every unit has been fielded at least once (by either me or my opponents). Still need to update it with my Feb results. Braxas, Venom, Krav Maga Agents, Rats. Stingers x2, Krav Maga Agents, Eldgrim. Lost with ??? 's Tor-Kul-Na/Nagrubs army to SonOfLoborocket (Nilfheim and TSA) and goodhueq (or goodhueq's brother, not sure which of you has the username and don't want to post real names without your OK) (Romans, Marcus, Me-Burq-Sa). Won against: MrBistro, Skynight, TheGuru; lost against: Roland (son of Ericpaperman). Won against: Shades Fan (twice! ); lost to arp12. Won against loborocket, superesenwein, kahlenar, jinx1016, and lost to rec_thug. Won against: Onacara, DonaldB, Loborocket; lost to To_Serve_Man. Minions of Utgar x2, 10th Regiment of Foot x2, Zetacron, Tarn Vikings, Marcu Esenwein. Won against: SuperEsenwein, Eann, Arp12; lost against: ASmiles, Kosta. Glads x3, Blasts x2, Major Q10, James Murphy, Otonashi. Won against: John, Patrick S, Taeblewalker, Loborocket; lost against: Tim S.
Won against: Arp12, Cleon, Cleon's Dad, RobertDD; Lost to: Bengi, Roscoe. Deathstalkers x2, Raelin (RotV), Kaemon Awa, Syvarris. Won against: Guido, Bengi, Habeo_Bukkit, ToddRenn; lost against: Onacara. Won against: Harvard, TheWriter, Nyys. Lost to: CurseYouKhan, I Like Pi. Won against: Jake, Mosby, Jim, Chad. Lost to: Kildawabit. Won against: Onacara Jr., Monkeyclops, RobertDD, ClanCampbell. Lost to: Onacara. Won against: Loborocket, Darkmage7a, KellyMonster, Brutella, SuperEsenwein, Pat. Lost to: TheGuru, Onacara Jr.
Won against: Jotun's Blacksmith, Cody, KellyMonster. Lost to: NYYS, SuperEsenwein. Won against: Kildawabit, TehFattestNinja, Fil, Loborocket. Tied with: Nyys. Lost to: Bengi. Won against: Scapemage921, KellyMonster, Darkmage7a, Mombo101. Lost to: Kildawabit, Shades Fan, Cleon. Won against: Taeblewalker, Dylan, Drewman-Chu, Loborocket, SonOfLobo, Warlord Alpha. Lost to: Nyys. Won against: Green Mtn Goblin, SonOfOPrime, Onacara, Scapemage921, Bengi, TheGuru. My pool: Microcorps x2, Roman Archers x2, Marro Drudge x2, Repulsors x2, Deadeye Dan, Kee-Mo-Shi, Sudema, Saylind, Elite Onyx Vipers, Mindflayer Mastermind. Winning armies: Capt America, James Murphy, Rats x2, Microcorps x2, Isamu; Sudema, Kee-Mo-Shi, Deadeye Dan, Iskra, Rechets, Khosumet, Anubians x1; Raelin (RotV), Major Q9, Rats x2, Krav Maga Agents, Nakita Agents; Nilfheim, Greenscales x3, Roman Archers x2, Mindflayer Mastermind, Otonashi; Nilfheim, Fen Hydra, Repulsors x2, Kee-Mo-Shi, Deadeye Dan. Losing army: Airborne Elite, Stingers x3, Mika Connour, Deadeye Dan, Tagawa Samurai. Iskra, Rechets, Estivara, Shurrak, Crixus, Marcu. Deathwalker 8000, Frost Giant, Marrden Hounds x2. Tor-Kul-Na (4-1), Nagrubs x2 (3-1), Major Q9 (3-1), Warriors of Ashra x2 (3-1), Eltahale (5-0), Phantom Knights x2 (2-1). Atlaga, Raelin (RotV), Protectors x3 (2-2); Kato, Ashigaru x2 x3 (2-0); Iron Man, Marcu, Warforged x3 (1-0). Grok Riders x2, Ne-Gok-Sa, Me-Burq-Sa, Marro Warriors (1-1); Incredible Hulk, Kumiko (2-1); Moriko, Raelin (RotV), Tagawa Samurai Archers x4 (3-0). Spartacus, Retiarius, Capuans x3 (3-0); Thanos, Abomination, Venom, Spiderman (3-0); Acorlarh, Kyntela Gwyn, Aubrien Archers x3, Warriors of Ashra x3, Isamu (1-0 [alley abandoned]). Overall record: 156-54, for a 74.3% win rate. Last edited by ollie; May 19th, 2012 at 04:44 PM. Spider Poison, Matthias Maccabeus, Momo, Jormi_Boced, Clarissimus, The View, Giberish, Nooblar, Super Geek, Joah, CornPuff, LilNewbie, Rehlers, Madster, Slade, Rev, Jexik and of course the guy that started this thread Rÿchean. Obviously there are many more that are “ Memorable “ however my memory isn’t. 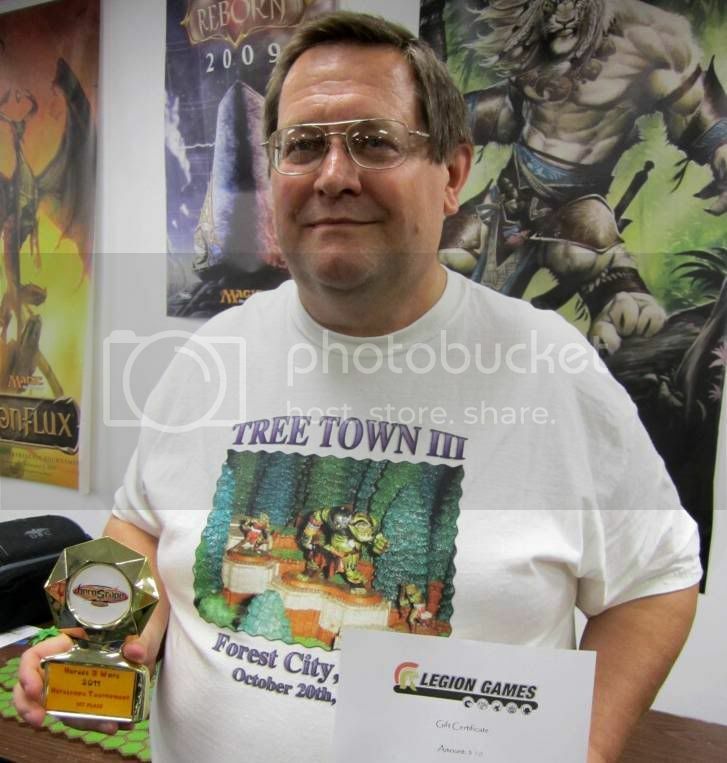 I was one of eight people who may have played in the first Heroscape Tourney ( Tree Town Tourney ... latter known as the Tree Town Open ). I have no way to verify that this was the first HS tourney but if that was not the first, I know it was the first to be publized on HeroscapersHQ and the facts are HS tournaments started springing up all over after TTO I ... so I am glad to be a part of that. "Events" even have their own section on the Heroscapers fourms. My favorite game was in the finals of the 2007 Austin Championship where I ending up playing my oldest son Jormi and we both got down to our final figure and went toe to toe throwing the dice back and forth until Jormi did get the win. As far as armies most anyone can figure that one out. It would have been a combination of Arrow Gruts, Swog Riders, along with Krug and/or Mimring to fit the point max point total allowed at that tourney. dang Im gonna have to go and think about this.. I do remember getting creamed at the first one i ever played in..
though I can honestly say this last one has been the best so far for me..
Ive also run 2 tournaments at D'con last 2 years and those have all been a blast.